Joe Cochran is the commander of American Legion Post 642 in Sedalia. He has presented over 1,000 flags to veterans' family members. Sedalia's Donna Freese hands out literature near a Blue Star Memorial. the plaques are located nationwide as a way to remember veterans' service. Next Monday is Memorial Day, a date established by Congress in 1968 as America's national day to remember and honor those American men and women who died in combat. If you are a veteran or know one, you likely think about those who died in combat on days other than just the last Monday in May each year. 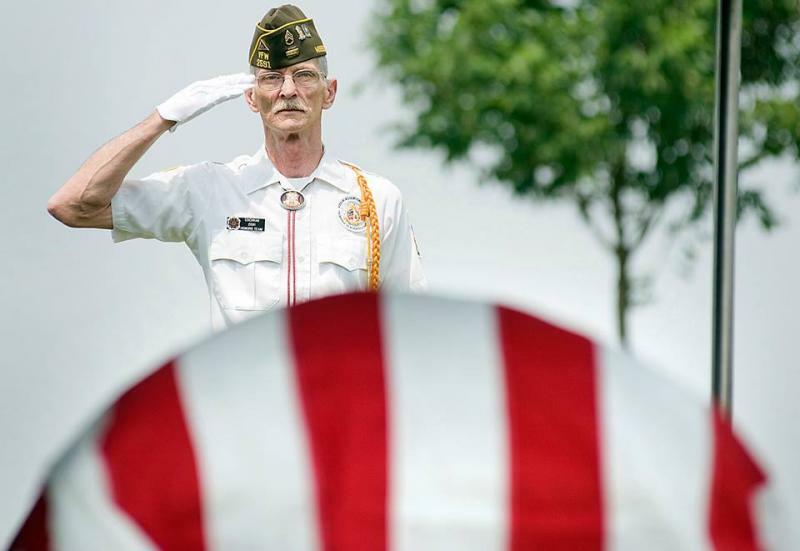 This week on Thinking Out Loud, KBIA's Trevor Harris talked to veterans and their supporters about what they think about each year on Memorial Day. Listen here to an episode of KBIA's Thinking Out Loud where Trevor Harris spoke with veterans and their supporters about what they will do and what they don't do on Memorial Day 2014. Vietnam Era veteran Jim Gaertner carries with him the memories of his fellow soldiers who did not come back from their combat duties. Gaertner enlisted in the army at age 17 as an infantryman. He completed that tour and another one as a platoon sergeant in Vietnam. I come from a family steeped in military tradition, a proud tradition of wartime service so I just wasn't going to be the first one to break that link. While I was in Vietnam, especially after losing friends, I made a promise to those friends that for the rest of my life I would ensure that they were not forgotten, that they would be remembered, that their names would be spoken often. I believe one of the ancient Greeks said that a man never dies while his name is spoken. I have made that a mission of mine to endeavor to live a life that would be honoring to the memory and the sacrifice of my friends who didn't come home. The veterans and their supporters I interviewed for this piece were not a homogenous group. They ranged in age from post 9-11 veterans up to World War II-era veterans and their supporters. There was however one common refrain cited by these Mid-Missourians. They told me it is critical that Memorial Day not be the only day Americans remember those soldiers who died. For example, Sedalia resident Donna Freese lost her father to injuries he sustained in World War II. As a way to honor her father's memory and that of all veterans who died in the line of duty, Freese maintains Sedalia's Blue Star Memorial. 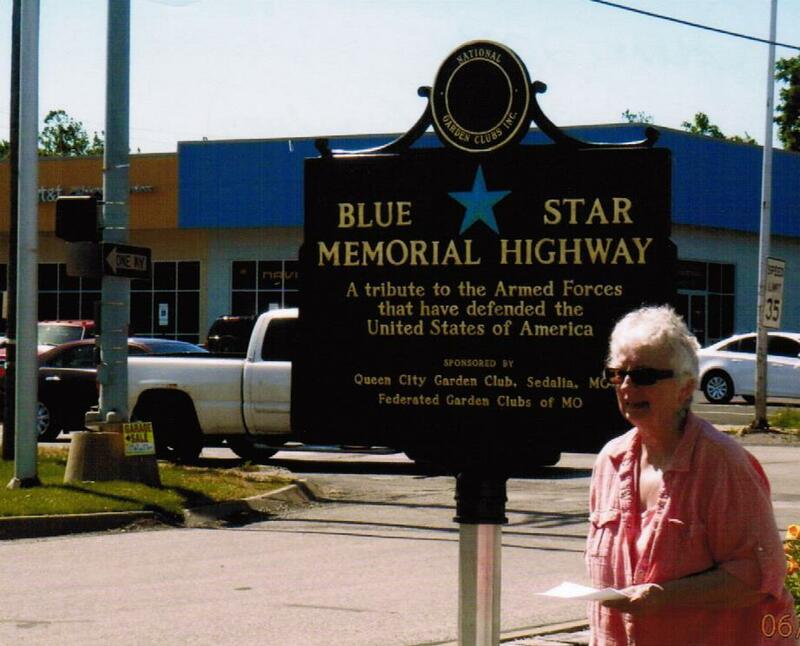 Freese talks in the piece about the history of the Blue Star Memorials and the meaning behind the markers that can be found alongside blue highways across the country. Missouri had the very first Blue Star marker erected in 1949 that pays tribute to military personal in past, present and future conflicts. [The Sedalia Garden Club] recently dedicated a brand new Blue Star Marker here in Sedalia at Broadway and State Fair Boulevard in conjunction with the local Parks Department. The significance of the Blue Star on the marker? During World War II if someone had a family member serving in the military they would display a blue star in their window to let the community know they had a family member serving in the military. Other Mid-Missourians with whom I spoke about their personal recollections of Memorial Day mentioned acts like placing flowers on graves, talking with community groups about veterans and collecting veterans stories as activities that help them raise awareness in the public consciousness about America's veterans who died while serving. Listen to Thinking Out Loud each Tuesday at 6:30 p.m. to KBIA 91.3FM. Roxanne Foster preserved some of Columbia's historical memory last year. In pursuit of her Masters Degree in News Reporting and Writing from MU's School of Journalism, Foster interviewed and recorded the stories of ten black and white Columbians who lived here during the desegregation era. On this week's Thinking Out Loud, KBIA's Trevor Harris visited with Foster about her subjects, their common themes and more. The State Historical Society of Missouri's Oral Historian Jeff Corrigan was Foster's advisor. Together, they recorded, transcribed and archived stories unique to Columbia in the late 1950s through the mid-1960s. 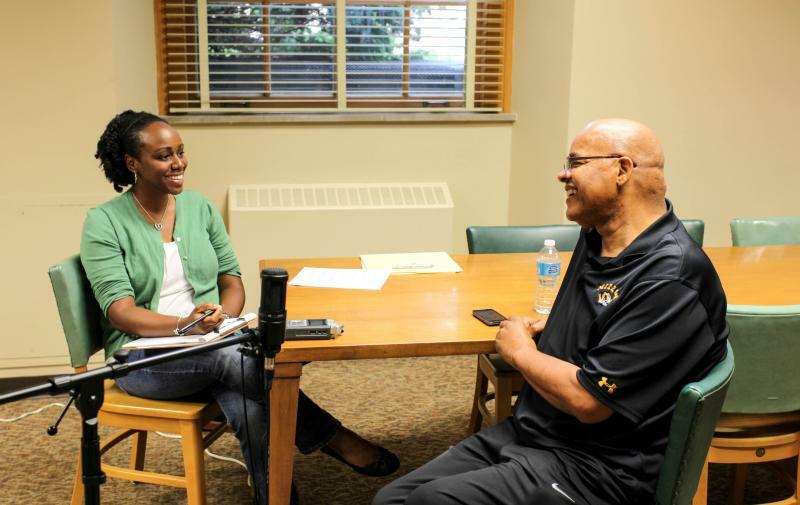 Listen to this week's Thinking Out Loud where the focus is on oral history. Trevor Harris and guests Roxanne Foster and Jeff Corrigan discuss how to best collect stories. Hear excerpts from a recent collection of stories from Columbians who lived through desegregation era. An excerpt from Marva Jo Brown is heard from her recently archived recording.